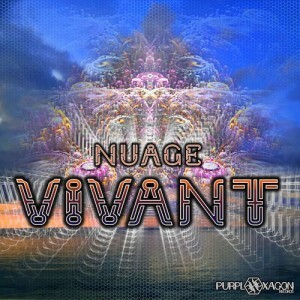 Purple Hexagon Records is proud to release Vivant, a mini album from Nuage, a French musician who has been producing music since the late 1980s. He has been a part of several projects including 2 Puissance 30, I Fly, Jaffa Project, Manitu, Virtuart, and Underhead. He has previously released two psychedelic trance albums under the Virtuart moniker – Virtuart & Friends (1998) and Drehkar (1999). Currently he is working on several projects including Nuage, Sacred Tree Portal, and Wavespell. All tracks written and produced By Olivier Nuage, France. Mastered by Kevin at Gpont Studio, Paris. MP3 Download | FLAC Download | WAV Download · Download count: 8,166.
so good. would love to more of that uptempo sound from the last two tracks. perfect. Nice EP, but nothing unique. Thank U to Olivier for the magnificent music!!! It is an honour for us to release this mini album!!!! Ouverture in shades of monsoon mist through rays of love and light of the sun. Starting from an original Auroville forest field recording and evolving into a deeper electronic groove evoking the crystal waves of Matrimundir. A special track made in 5.1 for the Ambiosonic Festival residency and dedicated to the starry night sky of sweet French “Provence” where the festival takes place…and featuring the “bird who lives in the tree outside”…..
From the vibrational field of the Shakti’s 108 names and moving towards the Elysians fields. This is the journey you are on ! it’s finally out!! this is the first Purple Hexagon release of this genre…not bad….first of many I hope!! Great job..as always from purple hexagon records! Keep the good job guys! Nuage is a post 2012 project, nuage means CLOUD in french, this cloud being the manifestation of our Collective Counsciousness, expanding, contracting….living! are really amazinmg for people knowledge, well, keep up the nice work fellows.